The Quilting Hermit: Sneak Peek! This is what Pop-Pop's quilt will look like once I sew it together. I sewed together row 1 together, although I sewed the first half of it together wrong. The squares were all turned 90 degrees to the right, so it messed up the design big time. After ripping out the three seams, I turned the blocks 90 degrees back to the proper position, sewed them together the right way, and row 1 is sewn together. I'm glad that I took a picture of the layout, because I've used it to double check my sewing more than a few times now! Looks great! Perfect for a man. Oh ... and I totally know about the seam ripping. I don't think I've made one project where I haven't had to rip out seams. 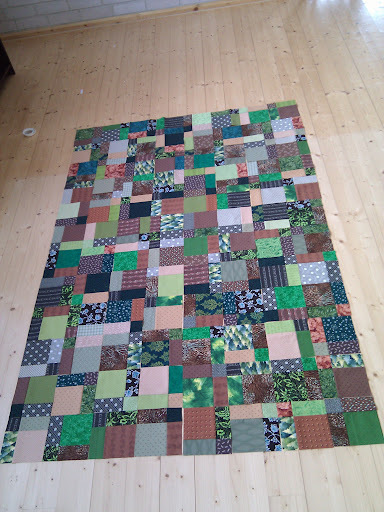 This quilt is really looking great! Over the years I have learned that if I mark the rows on the first block with row 1, row 2, etc...it helps keep the order straight. I hate ripping out seams. lol! I'm so happy that you found a friend in your area that quilts. A blessing indeed!